What kinds of CDs are there? What are the pros and cons of CDs? The fixed rate of interest is specified to you when you open an account, and determines how much money you get back when the CD “matures.” The maturity date is a fixed date of withdrawal, which means you can’t take out any money you put in until that date without paying a penalty. John has $10,000 he wants to grow with a CD. Currently, his bank offers a rate of 2.5% for a three-year term. John is confident he doesn’t need to touch the money for 3 years and buys the CD. In three years he gets back $10,770. At that point he withdraws the money and spends it on home repairs. 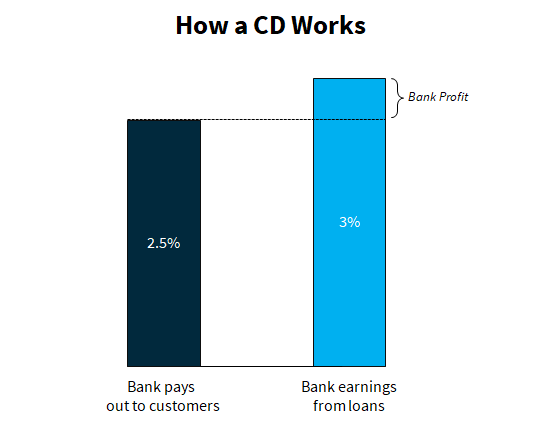 CDs are issued by banks and are considered low risk. The FDIC insures CDs for up to $250,000 per depositor. Credit unions may also issue CDs, called share certificates. These are insured by the National Credit Union Administration, also for up to $250,000 per depositor. Because of the way banks and credit unions make money from CDs, there’s is no explicit monthly fee for owning a CD. Unlike a standard savings account, your money is meant to stay in the CD for a specified term length, or certain amount of time. If you need to access the funds, the bank may allow you to make an early withdrawal. But usually you’ll have to pay a penalty. The cost of the penalty varies by bank and the maturity of the CD, or how long the money has been with the bank. For example, if a CD has a maturity of a year, a typical penalty could equal six months of the interest earned. So how long is a term length? The length of time your money has to stay in the CD depends on what term lengths are offered by your bank and which length you choose. Shorter term lengths are typically around three months, while longer term lengths can be five years or more. Let’s say you give the bank a certain amount of money to hold onto in a CD for five years. The bank will take your money and use it to loan a person or entity money for those five years. They may do this by either giving out loans or by buying a bond. A bond is a way to loan money to a government or company and get paid interest to do so. When the bank receives the interest payments from the bond or the loan, they’ll give you some or most of the return and keep some of it for themselves. This explains why banks do not charge explicit fees for a CD. The cost of a CD is baked into the return the CD can offer you; it is hidden. The bank loans John’s money out. The bank’s loans perform well over the next three years, and they pay John back $10,770 in three years. Everyone is happy. The bank loans John’s money out to some businesses that have questionable ability to pay them back. The bank’s loans perform poorly over the next three years, and they do not have money to pay John back his owed $10,770. The federal government steps in and pays John back his $10,770. If John had put $500,000 into a CD, and the bank couldn’t pay back what they owed him because of poorly performing loans, the federal government would only step in to pay John back for up to $250,000 out of the $500,000 he invested in the CD. In this case, there is some likelihood that John might lose a significant portion of his money. There is certainly some small risk that a bank may not be able to fulfil its obligation to you. But the risk is mitigated by the fact that the US government will insure your deposit up to $250,000. The longer you keep your money in a CD, the greater the interest rate you’ll earn from it. The reason for this is that borrowers of money typically have to pay a higher interest rate to borrow money for a longer period of time. Let’s say you wanted to borrow money for 10 years: you would have to pay a higher interest rate than if you wanted to borrow money for one year. Because many more things can go wrong in 10 years than in one to prevent you from repaying your loan. When you think about it that way, it makes more sense that when the roles are reversed and you are the saver/lender instead of the borrower, you should get compensated for locking your money up for a longer period of time with a higher interest rate. Taxes on CDs are an often overlooked issue. If you buy a CD with a 10-year term, each year you have to pay taxes on the interest earned. This means that each year the bank will send you a 1099-INT form telling you how much interest was credited to you, and you have to pay taxes on that, even though you won’t be able to touch the money until the 10 years are up. John invests $100,000 in a CD for a term of 10 years. During that period, his tax rate remains constant at 38%. Over 10 years, John’s CD value would increase to $129,000, while he would have to pay $11,000 in taxes over the course of that term. This would bring the net value of his CD to $118,000 after 10 years. If John’s tax rate increases or decreases in any given year, he would pay taxes according to that year’s rate. The tax treatment of CDs means that they may not be the best fit if you are are currently in a high tax bracket and are saving for retirement (when you are likely to be in a lower tax bracket). Savers who may benefit from a tax-deferred savings vehicle should look at a Multi-Year Guaranteed Annuity (MYGA). What if you want to take advantage of a CD’s benefits, but you still want some access to your money? One strategy that allows this is called CD laddering. This strategy gives you the potential to unlock higher rates while also retaining some access to your money. In other words, you’ll earn more without having to lock up the full amount of your money for a long time. But what exactly is a CD ladder? It’s a set of multiple CDs, each set up at different, short-term lengths. Let’s walk through an illustrative example to demonstrate how this would work. John wants to invest $20,000 and decides to use a CD ladder strategy. He splits this money among five CDs, each with an increasing term length. He invests $4,000 in a one-year CD, another $4,000 in a two-year CD, then in a three-year CD, a four-year CD, and finally a five-year CD. When John’s one-year CD reaches its maturity date, he can choose to use that money right away or reinvest it into another five-year CD. Then, when the second-year CD reaches its maturity date, he can use it or reinvest it. He can repeat the process with each CD as they reach maturity. This means that he has a CD maturing every year. 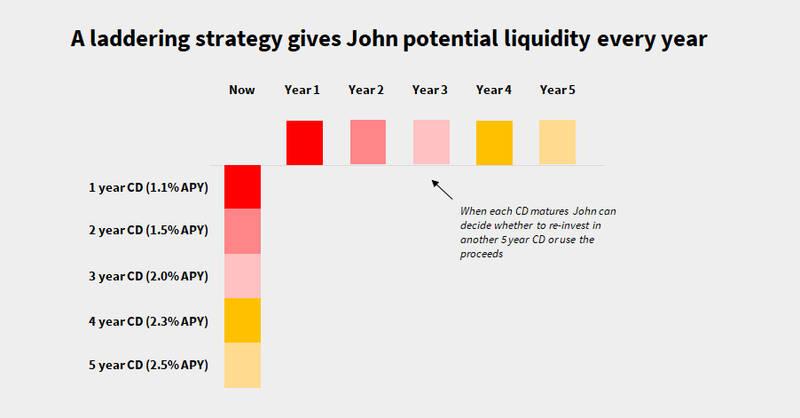 If John reinvests each year, he’ll eventually end up with 5 five-year CDs, maximizing his interest. If John decides to reinvest his money at the end of a CD’s term length, he can vary the term length of the CD he reinvests in. He doesn’t have to split his investment up over five CDs. He can put his money into any number of CDs with varying amounts in each CD. How does a CD ladder give John greater access to his money? Let’s say John has a CD with a maturity of one year and three more CDs with a two-year, three-year, and four-year term length. Once the shortest-term CD has reached the maturity date, he can use that money if needed while his other CDs are still maturing. When each of his CDs reaches maturity, he has the choice of using the money or reinvesting as he sees fit. CDs can be a lucrative investment for those who want to get more out of their savings. Standard CDs may be a good option if you want to put a chunk of money away that you know you won’t need for a certain amount of time. But there are other CDs that can better work for your individual investment strategy. CD laddering is one way to maximize earnings while ensuring your money is still available to you. It also allows for flexibility and the potential to lock in higher interest rates. If you’re strategic with building your CD ladder, you can maximize earnings and have your money ready when you need it. Jumbo CD: A jumbo CD provides higher interest rates but requires a much higher minimum balance ($100,000 and up). The standard guidelines for a CD still apply. Step-up CD: In a step-up CD, your APY will automatically go up at regular intervals. Liquid CD: These CDs usually provide a lower rate of return, but they allow you to withdraw money during the term with little to no penalty. Liquid CDs often require a maintained minimum balance. Bump-up CD: With a bump-up CD, if your bank raises its APYs, you can request higher interest rates. Usually, you can only request an interest rate increase once or twice, depending on the term length. Bump-up CDs often have lower interest rates than fixed-rate CDs. Some also have greater minimum deposit requirements. Now let’s weigh the overall pros and cons of investing in a CD. 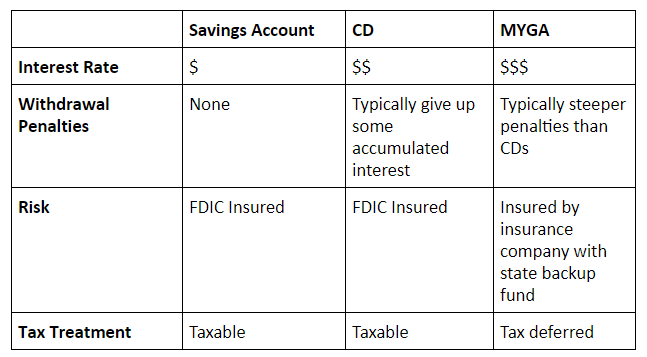 We’re going to compare a CD to a savings account and a tax-deferred annuity, the Multi-Year Guaranteed Annuity. One major appeal of a CD is that the rate of return is higher than what you’d get in a savings account. And it’s low risk because the account is FDIC insured. But the interest rates do tend to be lower than that for a Multi-Year Guaranteed Annuity. In general, CDs work for people who plan to put aside a set amount of money that they know they won’t need during the term length. If you think you’ll need that money before the term length is up, a standard CD might not be the right investment.